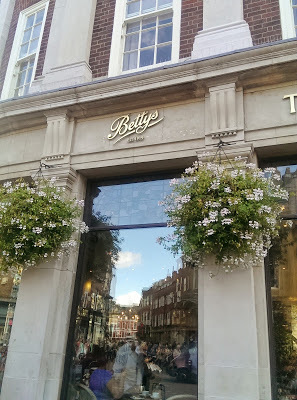 On the drive up to Leeds festival, Terri and I stopped off in the beautiful city of York for a spot of afternoon tea at Bettys tea room, so I thought I’d do a short review. We were lucky that we had a table booked in the Belmont Room as the downstairs cafe looked pretty busy! The Belmont Room upstairs was pleasant enough; a large airy room with a live pianist playing throughout the afternoon. 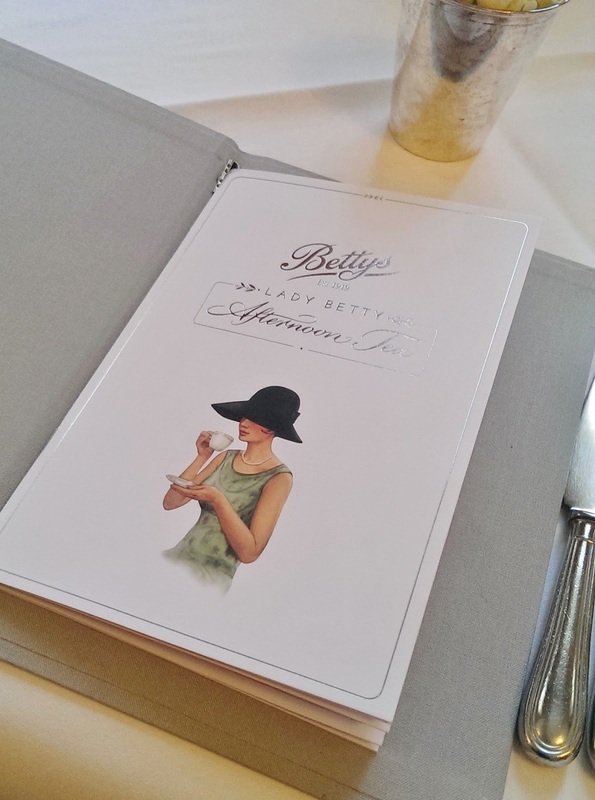 It lacked in atmosphere slightly and the Art Deco interior wouldn’t have been my preference in decor, but it was still elegant and the Bettys staff were friendly and attentive. I think next time I’d love to try out the downstairs cafe which seemed to have more of a buzz to it! Our afternoon tea started with drinks; and we both chose the rhubarb champagne cocktail and then I selected a bottle of elderflower fizz (no tea for me!) and Terri had a snazzy glass teapot of pink tea (I know nothing about tea). 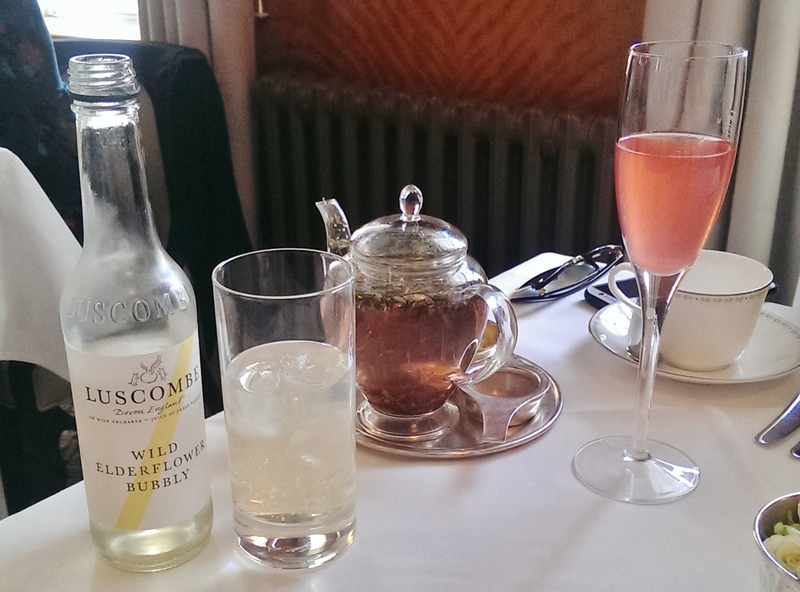 I really enjoyed my drinks; I’m not usually a big fan of champagne but I really loved the flavour of the rhubarb cocktail. 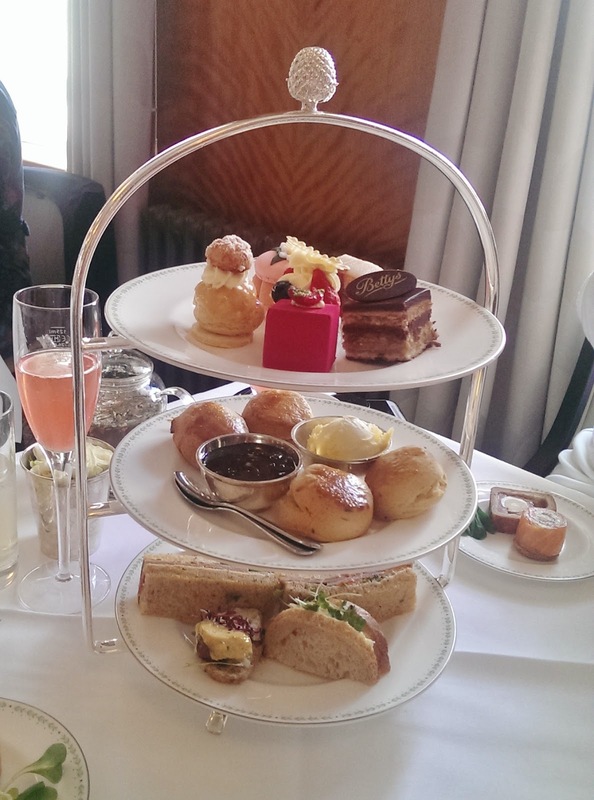 Before our 3 tiers of afternoon tea treats arrived, we had a few mini appetisers to enjoy first. These were a nice surprise, as the traditional afternoon teas I’ve tried previously just start straight with the sandwiches! 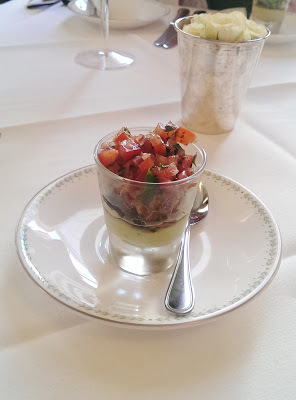 We were offered a prawn cocktail first of all, but as I am not a prawn lover, I opted for the vegetarian option of avocado, red onion, and tomatoes served in a mini glass. I’d never tried avocado before so I was excited to try it, and I did quite enjoy it, although I don’t love tomatoes. 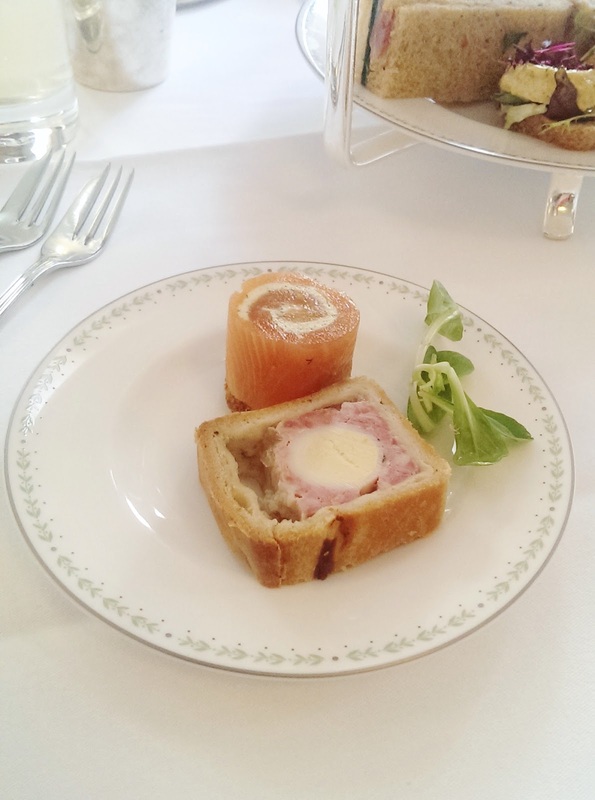 Next up we were offered the savoury selection of appetisers, which included a smoked salmon and cream cheese pinwheel, and a slice of miniature gala pie. I thoroughly enjoyed these and was really looking forward to our next course; the sandwiches. Our afternoon tea was presented to us on a three tier ceramic stand. There was only 3 finger sandwiches each; a ham and tomato pate, a coronation chicken with spiced yoghurt dressing, and an egg mayonnaise. I can’t say I particularly enjoyed these, as I prefer more traditional flavours (cheese and pickle, ham and mustard, cucumber and cream cheese etc). But they were perfectly presented and were clearly good quality ingredients. Next up.. my favourite bit; the scones! We were given two mini scones each; a traditional sultana scone and a lavender scone, with a pot of clotted cream and strawberry jam. I love fruit scones and Betty’s scones are delicious! I only wish they were bigger, I could have had another. The lavender flavoured one was quite different, and although it isn’t really my thing, it was still very enjoyable. Finally, the prettiest part! We were given six mini patisserie treats; a chocolate and raspberry square, an apple caramel macaroon, a chocolate and praline slice, a fresh berry meringue, a mini Battenburg slice, and a coffee choux pastry. We were pretty stuffed by this point, but I did manage to indulge on the meringue and the coffee choux pastry bun, and both were divine! We also tried the eye catching bright pink chocolate square, which was extremely pretty but very rich. 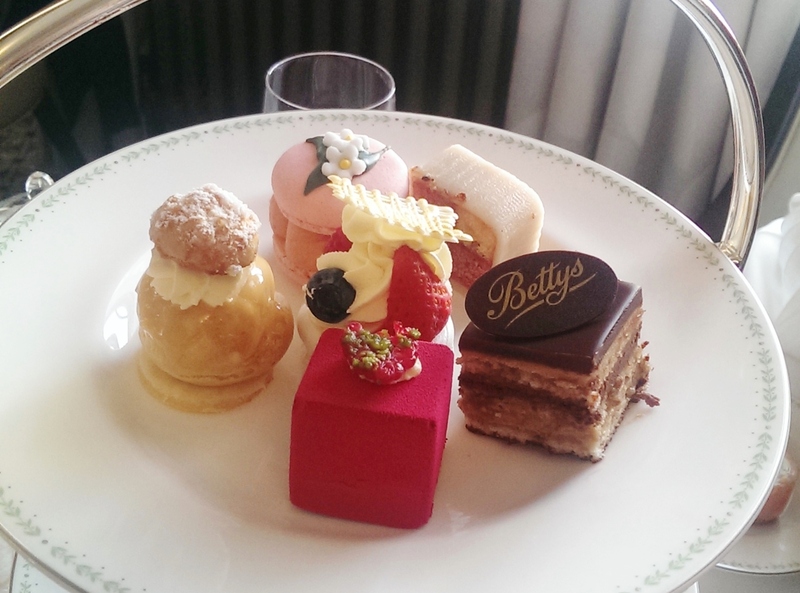 The Lady Betty Champagne Afternoon Tea is £39.95 per person. Betty's looks so pretty and the cakes look yummy! 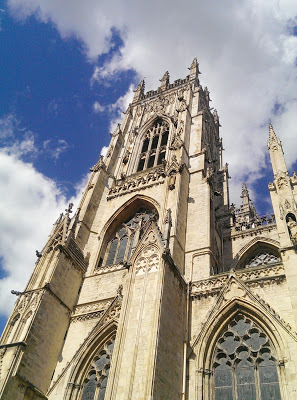 What a beautiful place Victoria – so totally English! The mini patisserie treats look divine, as does the rhubarb champagne. I keep hearing and seeing such good things about Betty's tea rooms. 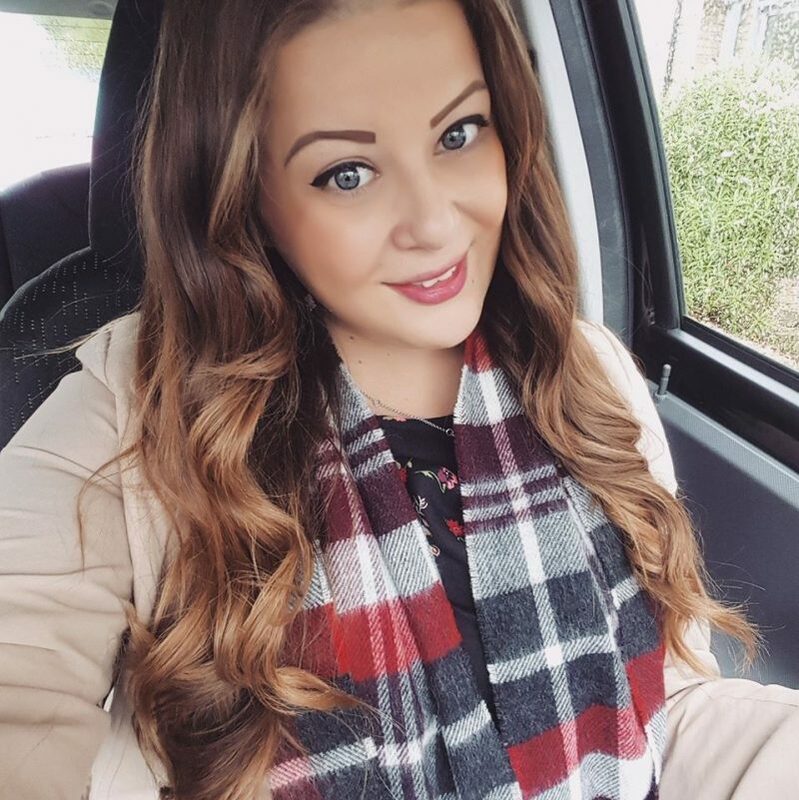 Afternoon tea's are so pretty and a great way to dine out elegantly 🙂 I really want to go to londons alice in wonderland style afternoon tea party! Amazing! Love this kind of preparation. It burst out my saliva, looks delicious and yummy! Sounds delicious! it looks so pretty and the cakes are look yummy. I visited Betty's a few years ago. It's such a lovely tearoom!